Hello my name is Levi. Music has been a part of my life for as long as I can remember. The first instrument I played, was the trumpet in fifth grade. I then switched to the euphonium and tuba. I learned how to play the bass in high school as well. I was also in choir in school, and continue to sing in my church's choir. I studied music education at Kansas State University and Arizona State University. 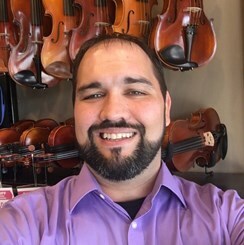 For the past twelve years, I was in the classroom teaching beginning band and beginning orchestra. I am excited to be a part of Music & Arts. Please ask me any questions about starting your musical journey.